The SupraVue® Lite brings level D collimated displays within the financial budgets of low cost Flight Training Devices for the first time. The world’s first high performance collimated visual display specifically developed and designed for General Aviation training devices. Q4 designed the SupraVue® in response to the flight simulation market’s move to high performance electric motion systems. Q4 developed the SupraVue® Plus display system to address the requirement for a common display system for all cockpit and aircraft types. 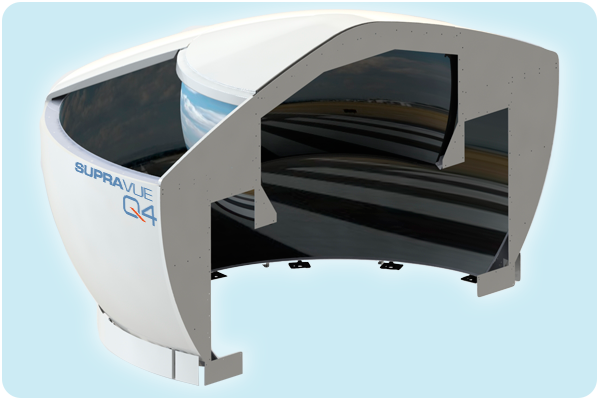 As an industry leader, Q4 developed the SupraVue® Lite display system to leverage the tried and tested design of the SupraVue in response to the advent of level 6 and level 7 fixed based training devices (FTD) and the airlines availability to claim simulator credits for time on low-cost training devices. The SupraVue® Lite brings level D collimated displays within the financial budgets of low cost Flight Training Devices. View the entire line of Q4 SupraVue collimated display products. Download, print or share a flyer for this product. Reach out and connect with a Q4 team member. 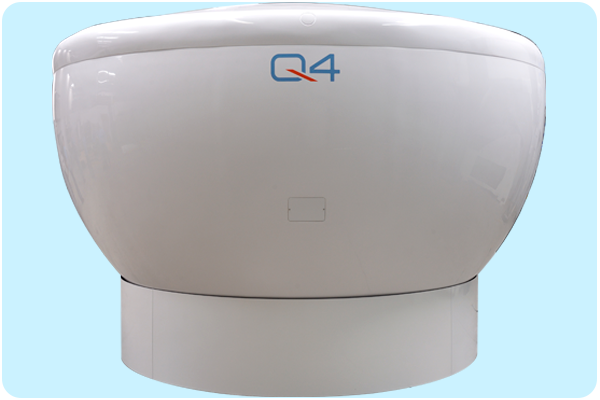 Q4’s SupraVue GA uniquely brings the advanced performance of collimated visual display environments to fixed base training devices in a compact, cost-effective solution. With a mirror radius of only 7 feet, the optical system has a large exit pupil that provides both pilots with the same image, allowing cross-cockpit viewing without distortions. The modular and compact design of the display shares the features of Q4’s market leading SupraVue product line. 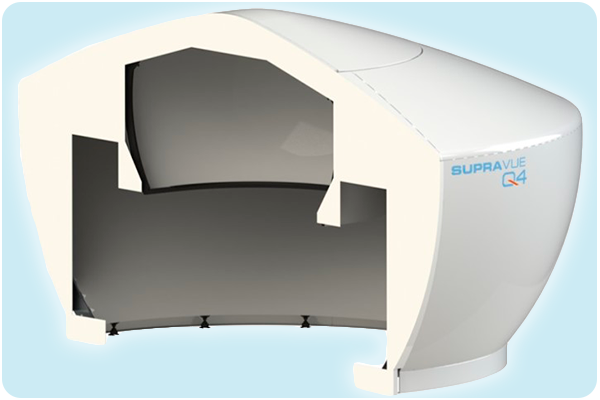 With Level D optical performance, SupraVue GA creates a highly immersive training environment ensuring delivery of the most realistic training possible. Previously this high level performance was only experienced when using full flight simulators. 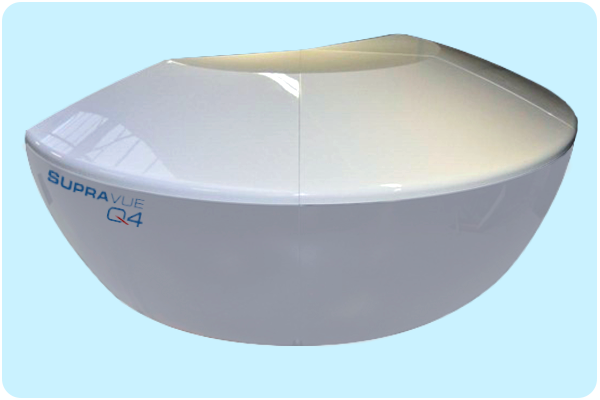 From the inception, Q4 developed the original SupraVue® display system to meet the future and any pending certification standard that was awaiting implementation at that time. This innovative approach provides the customer with a cost-effective, as well as a low risk solution, that supports the original equipment manufacturer (OEM) simulator platforms for many years. Utilizing this unique flat floor design, the OEM can deliver a SupraVue® Plus, which is operable with currently manufactured aircraft platforms and any future designs. As part of the SupraVue® Plus development, Q4 recognized the opportunity presented by the introduction of the latest projector technology which offered a 16:10 (WUXGA) aspect ratio. This expanded aspect ratio allows the delivery of 200×45 display systems with the same 3-channel projector layout.